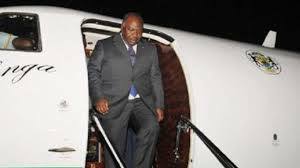 President Ali Bongo Ondimba of Gabon headed Saturday for his home country after he spent about three months in Morocco for medical rehabilitation and convalescence. President Ali Bongo has been receiving medical treatment in Morocco since December at the invitation of King Mohammed VI. The Gabonese head of state had suffered a stroke while attending an investment summit in Saudi Arabia in October last year. Although the military hospital in Rabat where had been treated discharged him, the African leader has remained in the kingdom for convalescence. During this period, he made short trips to his home country in January to attend the inauguration of a new cabinet and in February to chair a cabinet meeting and announce some appointments. Bongo, 59, came to power in Gabon in elections held following the death of his father, Omar Bongo, in 2009, who had ruled the country for 41 years. He won another term in office in 2016 in controversial elections with the European Union (UE) saying the results were cooked.